To use an old, but truly appropriate appellation, tango is all about passion, grace and fire. It is hard to think of tango without those three elements. But wait, there is a fourth: sexuality… Tango, which derives from a dance that was invented in Africa and brought to Latin America where it was melded into the candombe of African slaves and spread through other parts of the continent. Today it is venerated as the music and dance of Argentina romanticised by Carlos Gardel, Anibal Troilo, Osvaldo Pugliese, then re-invented by Astor Piazzolla, “rey del compás” of tango nuevo. It is also proverbially true that no one can play tango without referencing the music of those musicians. Some, however, have broken free and a fine recording of Amy Briggs entitled Tangos for Piano (Ravello, 2010) offers testimony to that fact as did Paquito D’Rivera’s swinging Tango Jazz (Sunnyside, 2010), Pablo Aslan’s stately Tango Grill (Zoho Music, 2010), Pablo Zeigler’s new take on the traditional tango, Amsterdam meets New Tango (Zoho Music, 2013) and Carlos Franzetti’s passionate, dramatic In the Key of Tango. However it is always interesting to view tango through the eyes of a foreigner. In this regard, two recent recordings are interesting. The first is a set of original tangos written by the American, Roger Davidson and the other is one by the Armenian, Michael Ashjian. Mr. Davidson’s album shows him to be a musician with an ear for instrumental colour and in his works it is refreshing to hear what might be described as “non-Argentinean” approach to the form. The writing is springy and graceful; the melodic lines clear and athletic, textures uncluttered; the lineage is certainly Argentinean, Astor Piazzolla in particular is paid homage to, as—to a certain extent—is Anibal Troilo, in this remarkable record, Te extraño Buenos Aires, a collection of fifteen tangos arranged by three pianists, José “Pepe” Motta, Andrés Linetzky and Abel Rogantini. This record might easily be the finest Mr. Davidson has made among all of his earlier tributes to Argentinean music. The work of all of these arranger/pianists is subtly different. All of the songs are impressive; even majestic, and suggest beautifully coloured landscapes that are brought to fruition by magnificent use of violin, bandoneon and the impeccable bowing of Pablo Aslan’s bass. “Ton Coeur en Flammes” best captures the spirit of the tango. It is just over five minutes in length, but it is felt that it could certainly be expanded into a much longer piece , so engaging is the material and so fascinating the colours produced by these instruments. There is clearly much for Roger Davidson to say in the field of the tango and José “Pepe” Motta, Andrés Linetzky and Abel Rogantini are the men to transmit the message of Mr. Davidson and this devastatingly beautiful music. Track List: No Importa; Fin de Semana; Recuerdo de un Amor; Melancholia; Tango para ella; O te Quiero; Si Loin de Toi; Alicia; Tango Triste; Quién Es Mi Amor; Adios Dolor; Para Este Dia; Ton Coeur en Flammes; Perdida; Te Extraño Buenos Aires. Personnel: José “Pepe” Motta: piano, arranger (1, 3, 8, 11, 15); Andrés Linetzky: piano, arranger (2, 5, 7, 9, 12); Abel Rogantini: piano, arranger (4, 6, 10, 13, 14); Ramiro Gallo: violin; Nicolás Enrich: bandoneon; Pablo Aslan: bass. Once you get past the word Tangomania the title of this record, which is rather commonplace, it is possible to enjoy the music which is not only imaginative, but inspirational as well. The reason for this can be attributed to several factors. The first of these is that Michael Ashjian, its composer and leader is a true lover of tango. Being non-Argentinean does not even enter into the equation as soon as the music begins. Then there is the fact that Mr. Ashjian is exceedingly passionate about his subject and has made every effort to make this known with his music. In fact, Mr. Ashjian is an honest acolyte of the tango masters. His scholarship is original; a demonstration equally of superb temperament and of great skill. The surging textures of the tango here, are best served by Mr. Ashjian’s percussive piano, although the rest of the ensemble are no slouches either. There is an appropriate voluptuousness to the music especially by the bandoneon player Eva Wolff and this is a welcome aspect to the music. 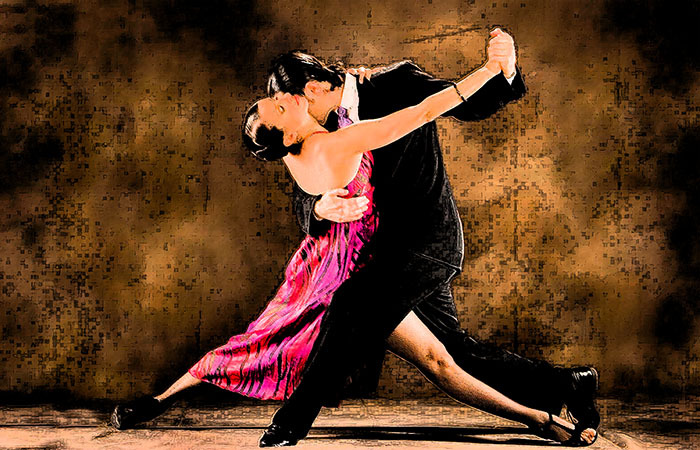 Dynamics play a huge role in the tango especially as the music is often used to convey a dramatically changing narrative–marked by rhythmic changes–to convey the passion of the moment. This is the pronounced strength of this recording. The recorded sound captures the tonal bloom and magic of the playing, making this a memorable issue by a pianist who is in the spring of his career. Much more is expected of Michael Ashjian and if this record is any indication, then his career is only beginning to take off. 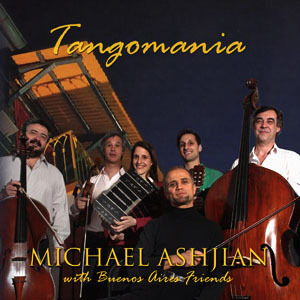 Track List: Friendship; Let’s Tango; Reveries; Still Tangoing; Homage to Astor Piazzolla; Tango Attraction; Quintet; Embrace; Nostalgic; Solitude; Fantasia “Tangomania”; Tango in Armenian Flame. Personnel: Eva Wolff: bandoneon; Pablo Agri: violin; Jorge Pérez Tedesco: violoncello; Michael Ashjian: piano, text and compositions; Esteran Fallabella: guitar; Daniel Falasca: contrabass; Matias Grande: violin; Benjamin Bru Pesce: viola; Silvia Legui: vocals; Alberto Burgos Dias: voice. Thank you so much for your valuable analysis and opinion towards my music: It is great encouragement at this stage of my career Sir !